Dialectical materialism is a political way to describe the way the world works and, more importantly, how it changes. In this article, Steve Rogerson applies that theory to the world of football and looks at how a team's supporters can use it to influence the way their team plays, for the better and for the worse. 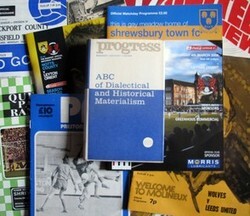 The phrase “dialectical materialism” is one that would normally be expected to turn up in the dusty pages of old Marxist texts rather than the glossy world of football. Yet this quite simple theory of understanding the world just as much applies to the mud and grass of the football pitch as it does to any other walk of life. Put simply, dialectical materialism attempts to explain the process of change. The dialectical side of the phrase says not that things can change or will change but that they are always changing. Everything is changing, right now, as people read this article. There is a wind blowing, rain may be falling, the food in the oven is getting warmer, and so on. The materialism side explains that this process of change is not preordained, there is no inevitability about which way the change is going to go, only that every action taken influences that change. And those actions take place all the time. The woman with the cold who breathed on the defender at the supermarket yesterday, the bootlace that wasn’t tied as tightly as it should have been, the sliding tackle five minutes ago that has created a slippier than normal piece of ground on the left wing. These are the obvious ones, but there are minor ones as well. In fact every action by every person affects the process of change. What though is remarkable about this is how in life in general, as well as in football in particular, people tend to believe exactly the opposite. How there is a tendency to think that where we are now is where we will always be despite the massive amount of evidence to suggest that we have only just got here and that here is not the same as it was five minutes ago. For example, take a Saturday afternoon watching television as the football scores come through. As each goal appears on the screen, it is commented on and in such a way as that the goal somehow marks the end of the match, no matter how early it is scored and despite the fact that every week many of the teams that take a lead end up not winning. “West Ham grab an early goal and look set for three points today.” “Mansfield are a goal down after five minutes, and their run of defeats is set to continue.” And so on. When West Ham’s opponents equalise or Mansfield get a goal back, the inevitability is still there. “Looks like the Hammers will have to settle for a draw.” This often happens despite there being 30 or more minutes left in the match. Increase this on to the macro scale and it gets worse. Some commentators and newspaper reports already give the league title to whoever happens to be in front at the time. Are memories really that short that these same commentators and journalists cannot remember 2002-03 and that 12-point lead Arsenal had over Manchester United only for it to be whittled away to nothing come the season’s close? In that season, so convinced that it was all over, a bookmaker even paid out on those who’d bet Arsenal. While every team in every division is under a process of constant change, for some that change is more evident than at others, which brings this piece back to the materialism part of the phrase. This says that the change is not constant and that the acts of everything and everybody affect how that change will occur. And that is why it is so important that supporters play their parts in helping to make sure a period of change ends up going in the correct direction. Out there on the pitch, one or more players may start by having a bad game. Those same players could continue that way throughout the match, could get worse or could turn their game round and end up playing really well, or somewhere in between these extremes. How the crowd reacts, even how individuals in the crowd react, can affect that outcome. So if a player is playing badly and the crowd gets on his back then his confidence could suffer and he may well end up playing even worse. If instead the crowd start shouting words of encouragement to him, cheering him on for effort even when he fails to win the tackle and so on, then his confidence can grow and the footballing ability that he has – everyone on a professional pitch has a high level of footballing ability or they wouldn’t be there – will start to shine through. Everyone can make a difference in every match. Spectators have an important role in moving a club forward, and it is a responsibility they should take at every opportunity. See also Changing Fashions of English Football Fans and How Football has lost its Violent Past.